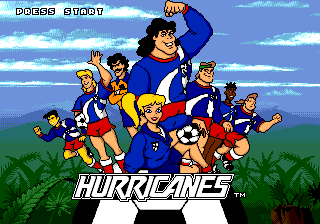 Hurricanes is a 1994 platformer for various systems, including the Sega Mega Drive and Sega Game Gear, by U.S. Gold based on DiC's Hurricanes cartoon. The MD and GG versions were only released in Europe (a SNES port developed by Probe was released in the US). Each version has different levels. Instead of being a soccer simulator, the game is a platformer similar to Marko's Magic Football: you play as one of the players on the fictional Hurricanes football team as they use their football to destroy enemies through various platforming levels. / kicks and / jumps. The ball will always come back to you after you kick it. In the Game Gear version, you play as the American player Cal, and the goal of each stage is to collect a certain amount of items to open up the exit to the next level (which is represented by a flag with the Hurricanes logo on it.) There are 12 stages which include a forest, an Incan temple, a mountain, and a locker room. After completing the game, you are treated to a one-screen ending with Winston Honeychurch saying, "You Win!" followed by the credits. The Mega Drive version consists of 5 episodes (worlds), each with three stages. Also, four of the Hurricanes are playable and can be selected for each episode; Cal, Hiro, Amanda, and Rude. However, the characters only differ in appearance and have no different attributes (like jumping higher, running faster, etc.) Unlike the Game Gear version, you don't need to collect items to open up the exit. You just need to get to the end of the level and touch the golden Hurricanes logo. At the end of each episode is a boss (and a sub-boss in the second level of the game).